This submission as part of BrickercupMasterX3’s Brickubbles month is dedicated to a few people I have sadly lost in my life growing up: my maternal grandma, Lydia Aznar-Alfonso, who passed away eight years ago from intestinal cancer, my chemistry teacher in third-year high school, Mr. Nicolas Apelinga, who passed away about three weeks ago, and one of my paternal uncles, Francis Duran, who as stated by my mom passed away today. 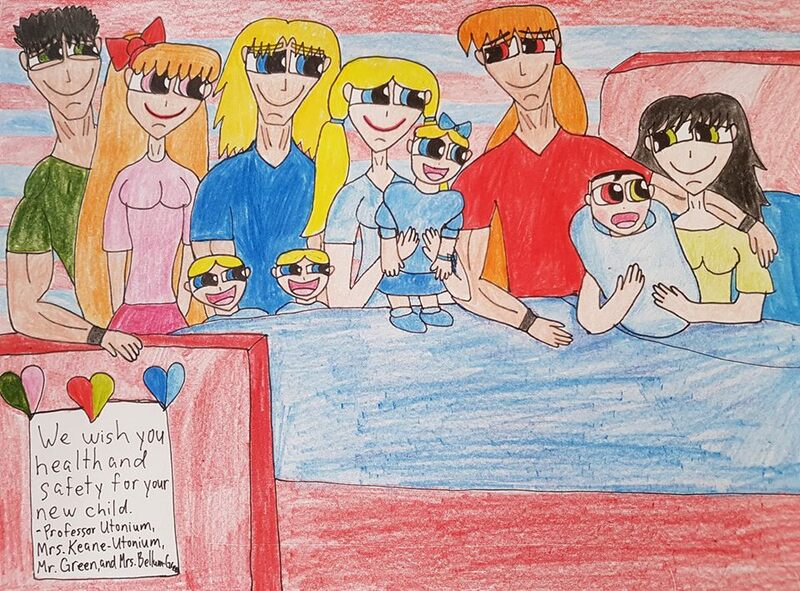 I would also love to dedicate this piece of RRB/PPG fan art to a fellow filmmaker who I had the pleasure of working with, Steffen Kaminski whose father passed away. May you all rest in peace, you will all be in my prayers and may the Heavenly Father keep you all in His realm. This is going to be the final Brickubbles Flashback, chronicling Brick’s and Bubbles’ major highlight in college. Technically, this is my second-to-the-last Brickubbles submission, as I have one more coming up. Furthermore, this flashback takes place in June 2014, where Brick, Butch, and Boomer were twenty-two years old, Blossom and Buttercup were twenty-one years old, and Bubbles was twenty years old. This was also the month where Buttercup gave birth to Blaze, hers and Brick’s first son, thus making Brick and Buttercup married while entering their fourth year of college. 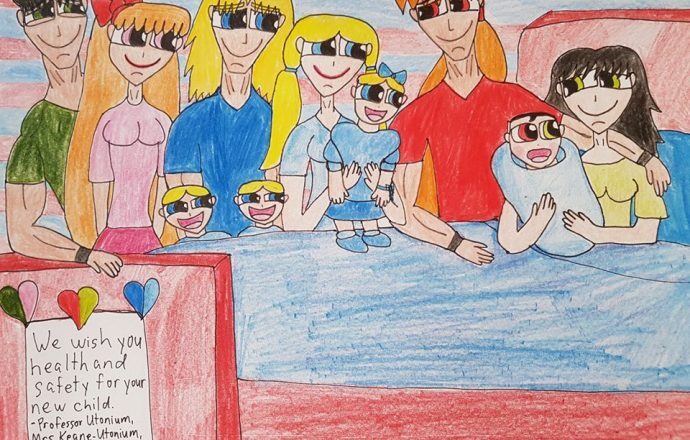 Moreover, since Boomer and Bubbles were the first to marry while still in college, they had their first three children, twins Bailey and Barley who were two years old and Brittany who was a year old. Butch and Blossom were engaged, as she stated to him that she would rather marry when they graduate college to which he gladly agreed. Enjoy this final flashback to the past. Brickubbles is kept as a loving platonic relationship, while the real couples in this flashback are Brickercup, Blossutch, and Boomubbles. There’s also a bit of Bunnitch here. Birth. Childhood. Adolescence. Adulthood. Middle Age. Old Age. Death. This is the life cycle of an average human being and is basically what we all go through in life. Everything influences us to be the people that we are from our environment to our family to our friends to our teachers to society as a whole. There will be good days and there will be bad days, depending on what one makes of it. Speaking of which, picture yourself as this young will-to-be parent. The thought of it is rather intimidating considering the responsibilities of being one, but with enough moral support and unconditional love one can definitely raise one’s child to be the best he or she can be. Submitted for the approval of The Brickubbles Flashbacks, I call this story Life’s and Love’s Gift. Brick, Bubbles, please take the floor. Brick and Bubbles: Thanks, Antoni. Bubbles: And our many condolences to those wonderful people you mentioned. Brick: Yeah, man, I hope you’ll be okay. Me: I will. Let’s dedicate this show to them. Brick: Well, hello darling, and my little scamps. Bailey: Ha! I got Flaminius. He’s gonna roast you alive. There’s no way you can beat me. Barley: Well, bro. I got Dasher! He’s gonna shock you down. Bailey and Barley: Aww…dangit. Another tie. Boomer: I see you enjoyed your game. Now, how about we hop on the couch with your sisters, cousins, mom, your uncle, and auntie? Bailey and Barley: Okay, dad! Brent: Dad, I wanna be like you, mom, Uncle Boomer, and Auntie Bubbles when I grow up! Brittany: Yeah, we get to do all sorts of adventures. Brooke: Fly around the city! Barley: Help out people in need. Bailey: Stop fires from happening! Birdie: And do all that stuff before we go to bed! Brick: We know you guys will be great heroes. Boomer: There will be a lot of hard work to be done. Buttercup: But if you’re tough and brave enough, we’re all sure you can make it. Bailey: Speaking of making it, when are Uncle Butch, Auntie Blossom, Brendan, Blake, and Belle coming back from grocery shopping? Bubbles: Well, they should be back in an hour. It looks like they’re getting as much good food as they can. Boomer: Sometimes I still can’t believe how much all of you kids have grown. Bailey, Barley, you’re growing taller and stronger every time I see you. And Brittany, you’re getting a lot smarter than I thought. Bubbles: And Birdie, let’s not forget about how fast you continue to run. Bailey, Barley, Brittany, and Birdie: Aw, mom, dad, thanks. Buttercup: Speaking of growing, Brooke your speech is getting clearer every time. That’s great. Brick: And Blaze, your mom has seen how tougher you continue to grow. Brent, you’re even fast enough to give your Uncle Boomer and Auntie Bubbles a good race. Blaze: Thanks, Dad, we’re really happy to have you as our parents. Brick: Bubs, I can’t even believe how fast we became parents. Even during college. Bubbles: Yeah, I can’t believe it too. It was clear that Boomie and I were meant for each other. So, getting married while being in college was crazy, but at least it managed to give us a back up in everything we do. Buttercup: It’s like it all happened just yesterday. Buttercup: BRICK! CALL IN THE CAVALRY! THE BUN HAS BEEN BAKED!!!!!!!! Brick: Mr. Utonium, to the Townsville Hospital and pronto! Professor Utonium: Yes, sir, eldest son-in-law! Mrs. Keane-Utonium: Good afternoon! My daughter Buttercup is due today. Mr. Green: We’ll wait outside for you okay, boys. Brick, Butch, and Boomer: Sure, dad. Bubbles: Okay, Bailey, Barley, Brittany, you go to Grampa and Granny Utonium, okay. Doctor 1: We’re ready for you Mrs. Green. Midwife: Congratulations. It’s your new son. Any names for him? Buttercup: Well, we’re gonna call him Blaze. Midwife: Well, I’m happy to announce that you four are going to be amazing grandparents. Mrs. Bellum-Green: Oh, that is wonderful news. Buttercup (gently): Hi, Blaze. I’m your mommy. Brick (gently stroking Blaze’s head): And I’m your daddy, little dude. Buttercup: And these are all your uncles and aunties and cousins. Brick: Guys, come over here for a sec. Brick: Bubs, you’ve been one of my greatest friends, and I am so blessed to have you as my little sister-in-law. You’ve seen the best in me and I’ve seen the best in you. I always loved you, as if though were the little sister from another from another mother. For that, I appoint you as Blaze’s godmother. Bubbles (joyfully with tears in her eyes): You mean it, Brick? Oh, thanks. Bubbles: Britt. Say hi to your little cousin, Blaze. Buttercup: And Boom Boom Blue, since my kid sis is Blazie’s godmother, I also appoint you as his godfather. Boomer: Wow, Butters, I’m so honored. Did you hear that boys? That means you also have to take great care of your little cousin. Blossom: Butch, this is definitely a moment we’re gonna cherish. Butch: That’s for sure, Blossy. That’s for sure. Mrs. Bellum-Green: They all grow up so fast. Mr. Green: Imagine taking care of Townsville as Team Xtreme, thriving in their college, and now we got two couples who are married and are parents. Professor Utonium: You know, sometimes I feel like I’m not even ready to be a grandpa. Mrs. Keane-Utonium: You and me both, John. I feel like I have a lot in my life I have yet to do. And the four of us being grandparents? It’s like if time went so fast on all of us. Mrs. Bellum-Green: Well, I’m sure all of our children have learned a lot as they grew. Professor Utonium: And I’m positive our grandchildren will do just fine as well. Bubbles: Oh! We should also show this to Mitch and Bunny! Buttercup: That would be a nice idea, Bubs. Brick: Go for it, kid sis-in-law. Bubbles: Hi, Mitch! Hi, Bunny! Bunny: How’s my darling sister doing? Bubbles: Check it out! BC gave birth to a lovely baby boy! Buttercup: Hey, Mitch. Hey, Bunny. Blazie say hi to Uncle Mitch and Auntie Bunny. Mitch and Bunny: Aw…He’s so cute. Brick (voiceover): This was definitely the greatest moment of not only my life with Buttercup but also for all of us. The fact that BC and I graduated from Townsville University while Blaze was still a year old was saying something. Two months after grad, we ended up having Brent. The year after that we had Brooke. It looks like our Team Xtreme family is getting bigger and bigger every time. Regardless of everything, I’m still really happy that Butterbabe is on my side as the greatest wife I ever had. Bubbles (voiceover): Life has a very funny way of working things out. I found out that I was pregnant with Boomie when I was eighteen and this was when we were in our second year of college. We decided to do the right thing and tell our respective moms and dads about it. They were shocked at first. But knowing how close Boomer and I were to each other, they respected our decision of being married. Imagine balancing college with being new parents with superhero duties. That’s a crazy deal. During those times, Boomie and I would always Dad and Mom babysit Bailey and Barley during class hours and on weekends they would be ours. Luckily we were able to graduate before I even had Birdie. Did we regret anything? No. Because at the end of the day Boomie and I found each other. Despite everything we went through, our initial rivalry, making up, being friends, dating, all the teenage craziness, and then finally being married, I am still wholly blessed that we are together. No one can ever replace Boomer. He’s unique in every way. The now 26-year-old Brick: It looks like our Team Xtreme is continuing to grow. The 24-year-old Bubbles: Even to this very day. Brick, Boomer, Buttercup, Bubbles, Bailey, Barley, Brittany, Blaze, Brent, Birdie, and Brooke: The End. I declare this final meeting of the Brickubbles Flashbacks closed. I will see you all in my final Brickubbles submission for this year. It’s certainly amazing how Brick and Bubbles grew from being just friends in kindergarten to being the closest of buds during their grade school to middle school years to Bubbles having a silly crush on Brick in the twilight of their sophomore years to finally just accepting the fact that they should stay friends and be with their greater equals. For Brick, it was Buttercup all along. For Bubbles, it’s always been none other than Boomer. Sure, they also have the usual crime issue sprawling Townsville. Despite all that, they are all one big Team Xtreme family and they stick together. Well, I thank you all for tuning into this final Brickubbles flashback and I will see you all on the flipside. Butch, Blossom, Boomer, Bubbles, Brick, and Buttercup from The Powerpuff Girls belong to Craig McCracken and Cartoon Network. Bailey, Barley, Brittany, and Blaze belong to me.